Mike Ullery | Daily Call Ohio State Highway Patrol Troopers Jason Hutchison, Charles “Chip” Gannon, Jim Davis, and Sgt. Dave Robison, left to right, pose with their awards for heroism presented by Piqua City Schools for the troopers’ part in saving the lives of two Piqua City Schools employees following a crash on I-75 in December. Hutchison and Gannon are from the Dayton Post of the Ohio State Highway Patrol, while Davis and Robison are assigned to the Piqua Post. Piqua City Schools Superintendent Dwayne Thompson shakes the hand of Ohio State Highway Patrol Sgt. Dave Robison during a presentation at the Piqua City Schools school board meeting, Thursday, Jan. 24. Robison, along with Troopers Jason Hutchison, Charles “Chip” Gannon and Tim Davis were recognized for their efforts in saving the lives of a pair of Piqua City Schools employees following a bus crash on I-75 in December. James Davis, Chip Gannon, Jason Hutchison and David Robison were honored for assisting bus driver Cayley Seitz and aide Harold “JR” Raybern Jr. in the four-vehicle crash, which occurred Dec. 14, and shut down southbound I-75 for nearly two hours. Seitz was trapped briefly on the bus, which was on fire. She suffered fourth-degree burns, which necessitated the amputation of part of her foot and toes. Raybern continues to use a wheelchair. Both have been in and out of the hospital since the accident, according to Piqua City Schools Superintendent Dwayne Thompson. Raybern called it a “miracle” that the troopers were nearby and able to get to the scene quickly. “If they’d been farther away, there’s a good chance we wouldn’t be here,” he said, adding later that he also was thankful to the district and his coworkers for their thoughts and prayers, cards and donations. 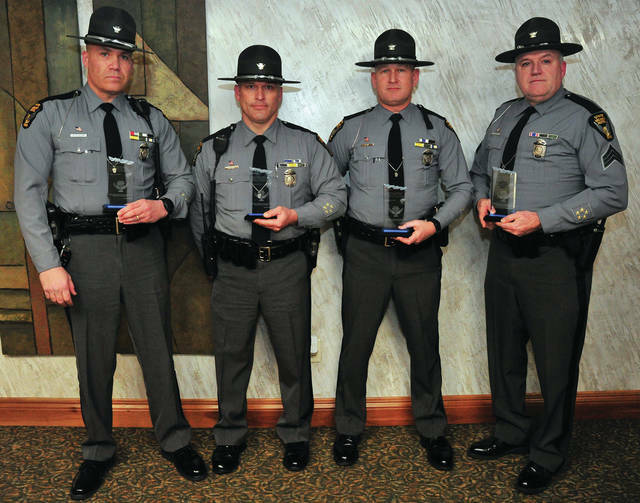 https://www.sidneydailynews.com/wp-content/uploads/sites/47/2019/01/web1_012419mju_pcs_ops_trooperawards1.jpgMike Ullery | Daily Call Ohio State Highway Patrol Troopers Jason Hutchison, Charles “Chip” Gannon, Jim Davis, and Sgt. Dave Robison, left to right, pose with their awards for heroism presented by Piqua City Schools for the troopers’ part in saving the lives of two Piqua City Schools employees following a crash on I-75 in December. Hutchison and Gannon are from the Dayton Post of the Ohio State Highway Patrol, while Davis and Robison are assigned to the Piqua Post. https://www.sidneydailynews.com/wp-content/uploads/sites/47/2019/01/web1_012419mju_pcs_osp_trooperawards2.jpgPiqua City Schools Superintendent Dwayne Thompson shakes the hand of Ohio State Highway Patrol Sgt. Dave Robison during a presentation at the Piqua City Schools school board meeting, Thursday, Jan. 24. 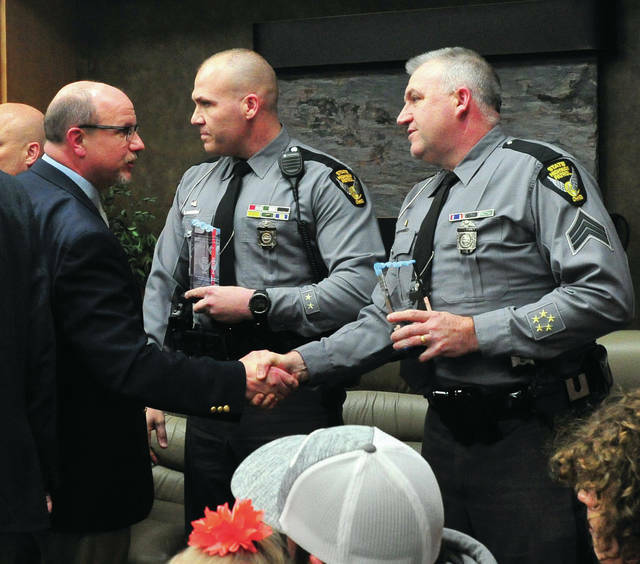 Robison, along with Troopers Jason Hutchison, Charles “Chip” Gannon and Tim Davis were recognized for their efforts in saving the lives of a pair of Piqua City Schools employees following a bus crash on I-75 in December.